Click chart for more in depth data. 1. U.S. jobs report: President Trump's jobs tally could move beyond 1 million on Friday. The Labor Department will give an update on how many jobs were created in July at 8:30 a.m. ET. Economists surveyed by CNNMoney estimate that the U.S. added 183,000 jobs in July, down from 222,000 in June. So far, 863,000 jobs have been created during Trump's presidency. The unemployment rate is expected to dip to 4.3%. 2. Toyota and Mazda factory in the U.S.: Toyota (TM) and Mazda have announced plans to build a $1.6 billion manufacturing plant in the U.S. that will create as many as 4,000 jobs. The Japanese automakers said in a statement that the new facility would be operational by 2021, but did not specify where it would be built. Shares in Mazda (MZDAF) gained 2.8% in Tokyo on Friday. The move is likely to be seen as a win for President Trump, who had pressured Toyota and other automakers to build more cars in the U.S.
3. RBS picks Amsterdam: The Royal Bank of Scotland said Friday that it plans to use Amsterdam as a European base if Britain makes a clean break from the EU after Brexit. Shares in the state-backed RBS (RBS)shot up as much as 4% after it announced it swung back into profit in the first half of the year. 4. 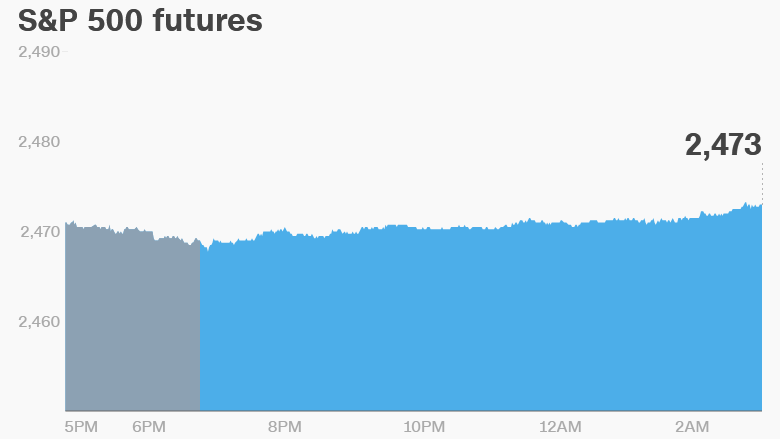 Global market overview: U.S. stock futures were higher on Friday. The Dow Jones industrial average closed flat on Thursday, while the S&P 500 was down 0.2% and the Nasdaq shed 0.4%. European markets were mostly lower in early trading on Friday. Asian markets ended the trading session mixed. 5. Stock market movers -- Western Union, Viacom, Mazda, Fluor: Fluor Corp (FLR) shares plunged 10% after hours after the engineering company lowered its outlook for the year. Viacom (VIAB) lost more than 8% in extended trading after it forecast lower ad revenues on Thursday. Western Union (WU) gained 5% in extended trading after its earnings beat analyst expectations. 6. Earnings: AMC Entertainment (AMC), CIGNA (CI), Potbelly (PBPB), Trivago (TRVG) and US Cellular (USM) are set to release earnings before the open Friday. Warren Buffett's Berkshire Hathaway (BRKA) will follow after the close.